Ever since we discovered how to make saline slime we’ve been loving exploring our new obsession. It’s so much fun to play with, but I knew there was an opportunity here to turn this new interest into a learning experience. 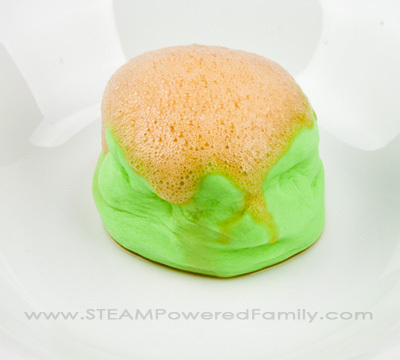 So I developed our first Slime STEM Activity, Erupting Volcano Slime! The best part, it is so gentle for sensitive skin (I have highly allergic and sensitive skin), with no liquid starch, powdered borax or detergent. 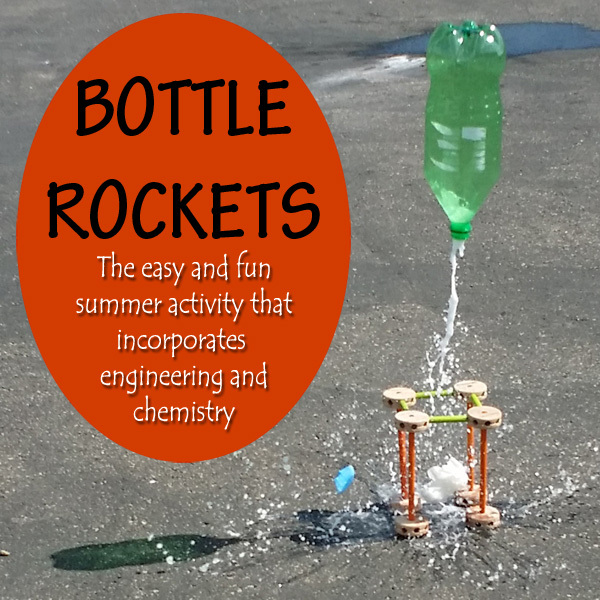 Great for hands on learning! 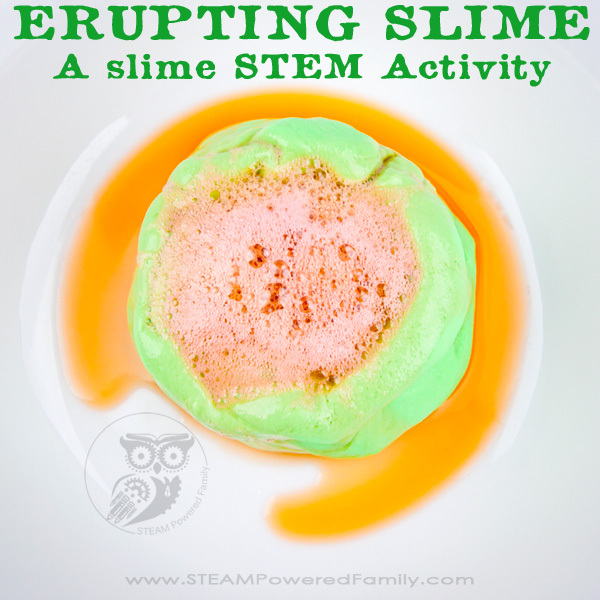 Erupting Slime – A Slime Volcano That Erupts! 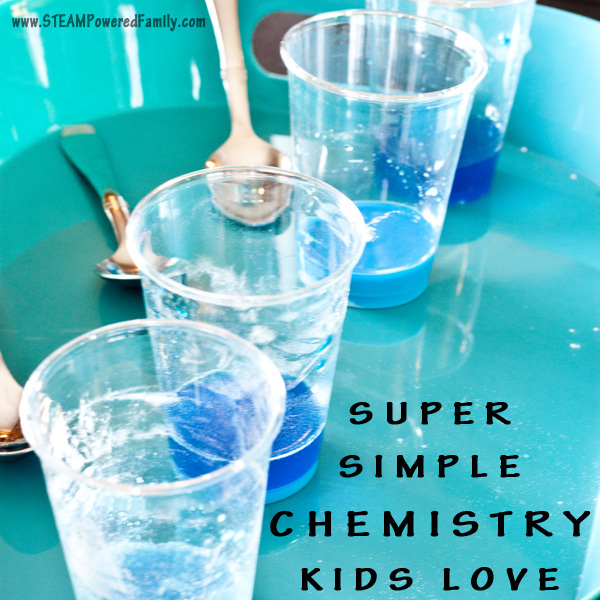 As most of my readers know, we love a good baking soda and vinegar reaction. 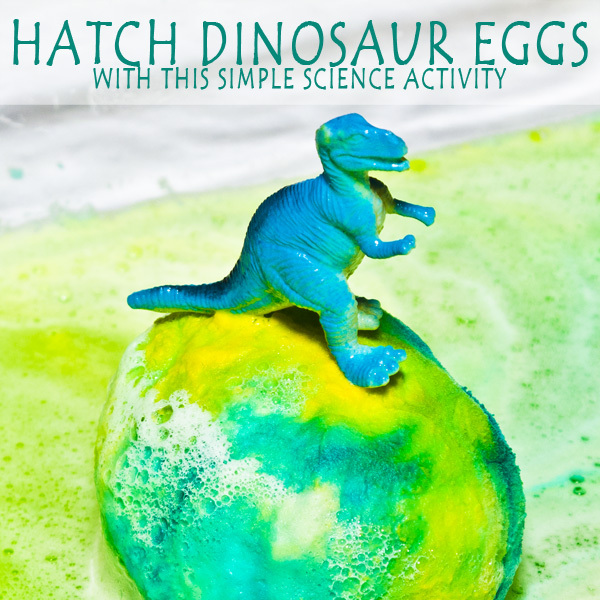 Whether we are hatching dino eggs, making rockets blast off, or doing a simple chemistry lesson, the baking soda and vinegar reactions are always a hit. So as I was mixing up a batch of saline slime, it hit me that we could do something really cool here. And guess what? It worked so much better than I expected! Buffered Saline Solution – You can find this in the eye care aisle. Make sure it is the buffered saline. In the States this will contain boric acid, but the one I bought here in Canada doesn’t have boric acid or sodium borate listed in the ingredients. It still worked though! That’s why we love this recipe so much. I have EXTREMELY sensitive skin and this recipe is so gentle. I love that it is liquid starch, powdered borax and detergent free. 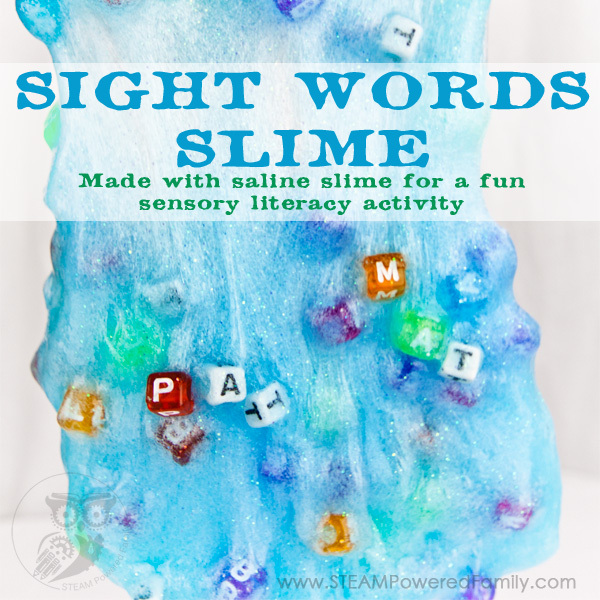 But even if your buffered saline lists boric acid or sodium borate, I’ve heard wonderful things from readers about how nice the slime is for sensitive skin. You may wish to use safety glasses, gloves, smocks, etc. Use common sense and appropriate safety precautions at all times when doing science. Consider your child’s age and abilities when deciding if an activity is appropriate for them. Start by making the slime normally, you can get full slime making details here, but I’ll quickly recap to save you some time if you are familiar with making saline slime. Add one bottle of glue to a bowl (it’s 4 oz but you can estimate, it’s very forgiving), add 1/4 teaspoon baking soda, mix. Add food coloring. Mix. Add a couple of drops of saline solution, mix. Add a few more, mix, add a couple of more drops, mix. By now it should be stringy and pulling into a lump. Add a bit of saline to your hands and start kneading and mixing it with your hands. Work just until it is no longer sticky. If you over do the saline solution it will not be as stretchy. 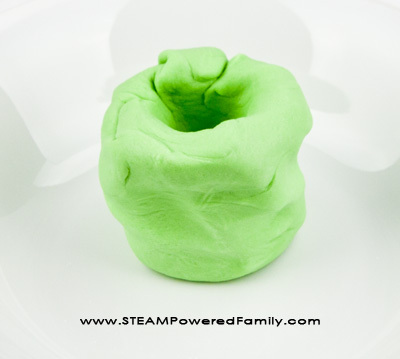 Which is not a huge deal with this experiment, in fact stiffer slime might help with building your volcano structure. Once you have your slime, set it in a bowl. Push down in the middle to create a hole and add 1/2 tablespoon of baking soda. Mix it in with your hands. Repeat about 5 or 6 times until the slime starts to stiffen and feel a bit gritty. 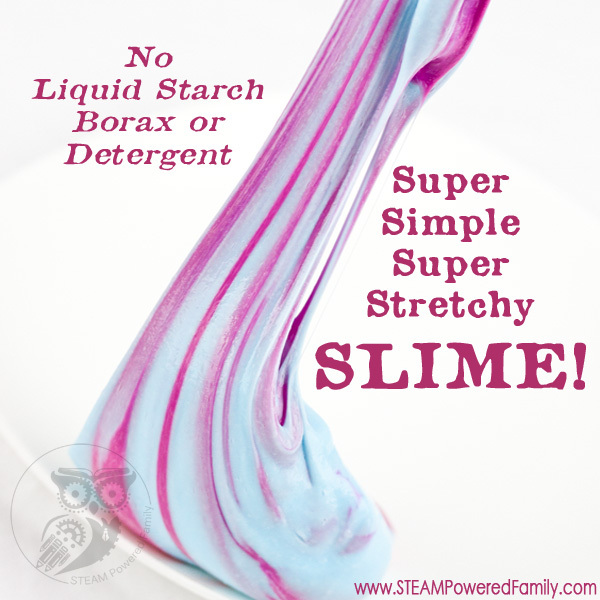 The more baking soda you can work into your slime, the more reaction you will see. Add some vinegar to a cup and add a bit of food coloring if you wish. 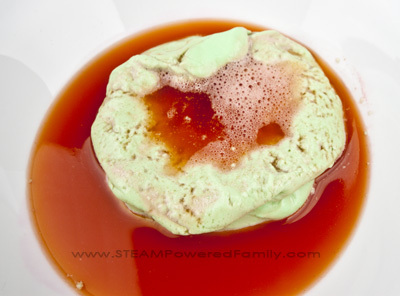 Set the slime in a bowl and shape it into a volcano shape. It will not hold the shape for forever, it is still slime, but it should be stiff enough to hold the shape for a bit. If not, add more baking soda and really work it in. Using a medicine syringe/dropper or pipette or spoon, add a bit of vinegar to the inside of your volcano. Repeat. What we loved about this experiment is how long the reaction lasted. Because the baking soda is worked into the slime volcano, the “eruptions” would last for a minute or longer. Normally our baking soda and vinegar reactions are quick and short lived, but this version lasted a long time. And as the reaction proceeded, more would happen as more baking soda was exposed from inside the slime. Another fascinating result was the fissures that developed in the slime where the baking soda reactions happened in the slime leaving fissures. Just like happens to rocks in nature where natural erosion of the weak points happens. Such a cool result! After you are finished with your experiment, throw out the slime. 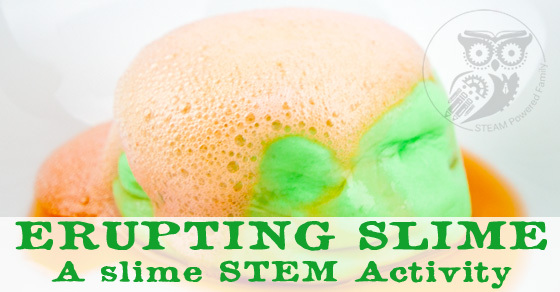 NOTE: Playing with slime is a lot of fun, but, like any activity, parents need to be involved and informed. Please, read all labels. I can only speak to the products I can buy locally. The formulas and products in your area may have different ingredients or formulas. Extreme caution should be used if you are substituting any ingredients. Be informed and use appropriate safety steps. If you have any questions or concerns, speak to your doctor or local health practitioner.